The "Lotos" hotel complex is situated 50m. away from the sea coast. The hotel part has 2- and 3-star category rooms. 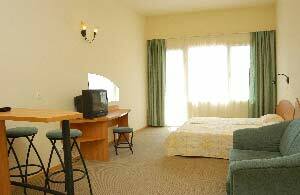 The hotel is new and modernly furnished. 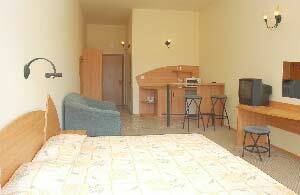 The 3-star sector is located on the second floor and includes double rooms, kitchinettes and appartments. All rooms are wide enough and also have extending sofas, TVs, minibars and phones. The appartments consist of a separate bedroom and dining room with kitchinette and extending 2-person sofa. The rooms have private terraces and bathrooms with WC. The 2-star rooms are on the 1st floor and have private balkonies and bathrooms with WC. 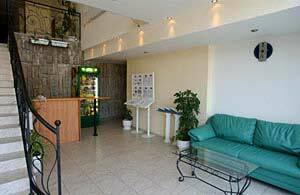 Restaurant, pharmacy, currency exchange office, parking lot and swiming pool are located very close to the hotel. For 10 days this hotel lodged me with my wife and two small children instead of paid 3+ in a doghouse. Lack of the pool at all didn't frighten. 8 numbers from 25 are in sheds on boondocks of the main building where it is necessary to pass through parking for stuff transport, and also a platform for goods unloading for local restaurant, a smoking-area for the personnel and a place for a sink of garbage tanks. Directly opposite to a public toilet of the next hotel behind a ragged entrance door you get to the room about 10 square meters with the broken beds, the fallen-out sockets and the same look furniture. Refrigerator hardly breathes, TV - the following second model in world, within the walls of a hole, etc. The bathroom is a separate song: the room of 3 square meters where water from a shower falls directly on a toilet bowl and toilet paper as to turn a shower is no place; thus the person taking shower rests the person against a window leaf which just comes to the above described platform. Water hot flows with variable success. Certainly in rooms any Wi-Fi. It is also possible to forget about normal towels, microwaves (about which it is written on a hotel site), safes and hair dryers (even if you will bring the hair dryer with yourselves, you will be able to turn on it only about an entrance door over the TV) Same with restaurant Lotus: for breakfasts can offer very nasty food, and if you politely ask waiter at first food, then a glass for the diluted juice, then a fork with a knife, then a napkin, and then a plate as on a buffet never it is possible. We flied to Bulgaria from Moscow and took round through TUI (large operator would seem), but met the guideguy only for the 9th day of our stay in hotel (such impression that it disappeared from the same disappointed tourists). Such impression that reviews of this hotel are left by interested persons. The only thing pleased: to go to the sea only 7 minutes. I loved this hotel when i was there. The trick is to always be drunk! 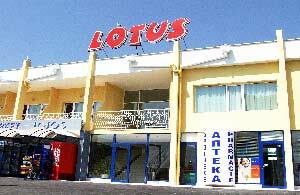 i would recomend this hotel to anybody after booking a holiday to stay in the pomorie hotel to find it was a s**thole i called into lotus hotel and they was so helpful and we stayed for the remainder of the holiday.the lotus restarant was by far the best value for money in sunny beach.say hello to chris if you go.